What can I do to improve this map? I want it to remain fairly wide open, but I am not sure of what details I can add to this crypt. 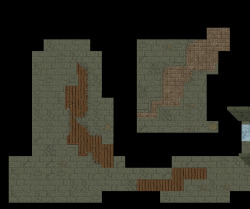 I went through the entire map editor and found nothing that fits well for a crypt setting with these tiles and walls. Does anyone have any ideas? It's a crypt right beside a small town so I don't want anything too fancy. It will have little critters like spiders/centipedes/bats and also some undead. 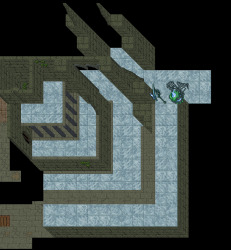 also using more than 1 floor always looks better in my opinion. use items that fit the enviroment. always. always. but dont forget to keep it simple and clean. dont be like me. 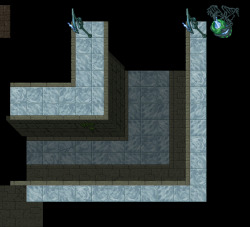 I understand how tile combinations and floor levels work, but none of them seem to fit for what I want unfortunately. I am more interested in what details people may include. I want this to be a dark and depressing setting. Not magical or epic. Maybe some torches on the walls? Some statues maybe, or pillars. 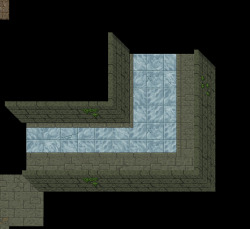 Try adding skulls on the wall, axes, arrows, maybe some blood even? This screen is a small portion of the whole crypt, but the general idea. Dark Cathedral barely has any detailing, and it completely changes the feel and style that I am striving for. Dark Cathedral isn't so good either . Some cracked walls would go a long way. Perhaps some parts of the walls caved in, exposing the outer cave within the crypt. Cracked walls leave debris, perhaps some near the walls. Floors crack over time or have a layer of dirt/dust etc. on them. Some wood used as support at a later stage in the crypt to ensure that the ceiling does not collapse, so it would look a bit out of place but then again, it would fit perfectly if you can execute it in a way that people would actually recognize it as such. Maybe some weeds/green in a place that is moist. Maybe some belongings from the deceased? 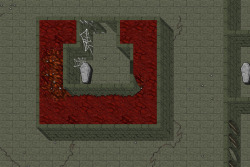 Put some monster spawns in there, open up tibia and play through it. Does it feel empty or just right? I mean, all the items that players would drop on the ground, all the creature bodies that are decaying over there. This adds up to the "details" as well.